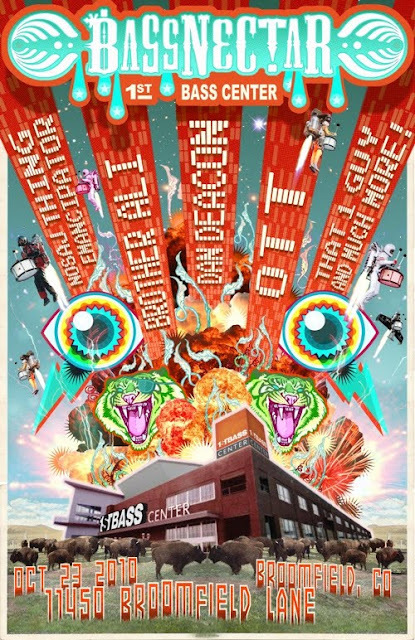 The rumors are true: the 1st BASS CENTER will launch on October 23 in Broomfield, CO. This will be the first time in years that the Bassnectar Team has ever produced an original/unique/customized event, and this will definitely be the biggest and most insane to date. Joining us will be Dan Deacon, Brother Ali, Ott, Nosaj Thing, Emancipator, That 1 Guy, and much more. This is the first incarnation of the Bassnectar Festival, and when we consulted the magic 8 ball, it replied that the perfect place on earth to kick off would be Colorado!!! (Broomfield, CO is 18 miles close to Denver, 11 miles close to Boulder, 45 from Ft Collins, 71 from Vail, 105 from Aspen, 236 from Durango, 942 from San Francisco, only 4701 from Brazil, a mere 5780 from Tokyo, and a tender 6758 from Lebanon!!! So this is a ‘Come one, Come All!’ type of thing). This is an all ages event. The “Bass Space:” an all-night special room away with plush loungy furniture, free refreshments, a private cash bar, and more.